We're giving away five (5) digital copies of Disney’s The Little Mermaid, and all you have to do is provide your name, email and mailing address... No trivia questions, running through hoops, etc.. How easy is that? We'll select five winners (one copy per household) and send your digital copy via USPS. All entries must be received by Thursday, February 21st at 11:59 PM EST, so act fast. Good luck! Synopsis: For the first time ever in sparkling 4K Ultra HD and featuring a fin-tastic sing-along mode along with over 45 minutes of exciting new bonus features for new and old fans alike to enjoy. 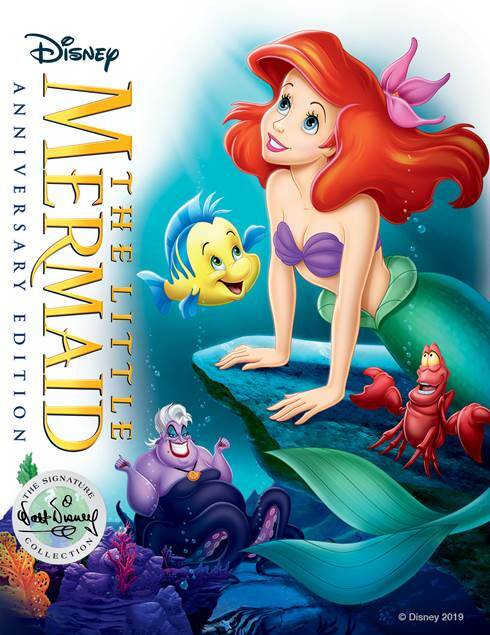 In honor of its 30th anniversary, two-time Academy Award-winner (Best Original Score and Best Original Song "Under the Sea," 1989) "The Little Mermaid," dives into the highly celebrated Walt Disney Signature Collection with all-new bonus features and a sing-along mode. The magical, musical tale of mermaid princess Ariel - along with lovable sidekicks Sebastian and Flounder, and the love-to-hate sea witch Ursula - is shore to make a splash with all generations when it comes home for the first time on 4K Ultra HD, Digital and Movies Anywhere on February 12, and on 4K Ultra HD and Blu-ray on February 26. The Little Mermaid is available on Digital, February 12th and Blu-ray/DVD, February 26th. Click here to purchase online.